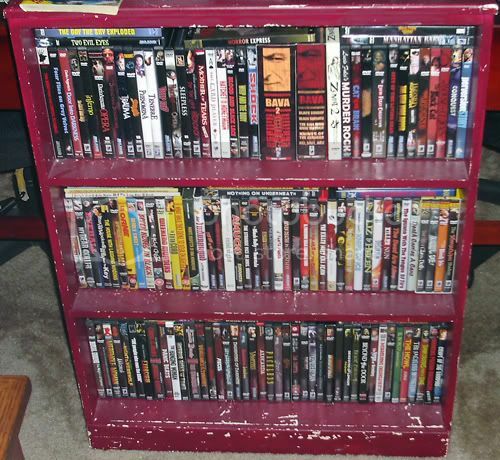 I decided to put all of my Eurohorror DVDs together. Of course, I failed. I have too much to fit on one set of shelves. The millennial Eurohorror is stashed somewhere else as are a few other things just wouldn't squeeze in. Where's the rest of my dang collection? The Asian horror, American, classic, crappy, and all the rest are stashed in two other overflowing and less photogenic cabinets. There's also the Rubbermaid tub of DVDRs in the closet which is dangerously heavy. So this poorly taken picture is a poor representation of my collection but I wanted to share it anyway. I like how The Day the Sky Exploded sticks out like a sore thumb. Nice! The one that sticks out like a sore thumb, to me, is MURDER ROCK. That's a homemade cover for Murder Rock. I actually bought a bootleg of that movie about a week before I found out that there was going to be a Region 1 release.